A presentation of the new PreSonus Studio 192 Mobile USB 3.0 interface. Copper Reference: Is it a bird? Is it a plane? No, it's... Tracktion's debut on the audio interface market. And, it does have tubes. Yes: TUBES. PreSonus introduces the Studio 192 Mobile, a USB 3.0 audio with a small form factor suitable for both mobile and studio use. Native Instruments has launched a limited-time holiday sales special on Komplete Audio 6 at participating retailers and at the NI Online Shop. 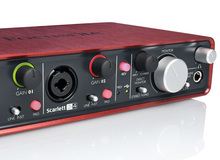 From AES booth 118, Tascam has introduced the Celesonic US-20x20 USB audio interface.